Our ideal morning market swing as I mentioned in today's members-only video has played out. A price drop to reach spike targets, then a reversal rally to gap fill. This is the third straight day the market had done this for us, it's not always this good or frequent. 6 winning trades in 3 days is tough to beat and one day pays for years worth of access to our Wealth Building Newsletter Service. 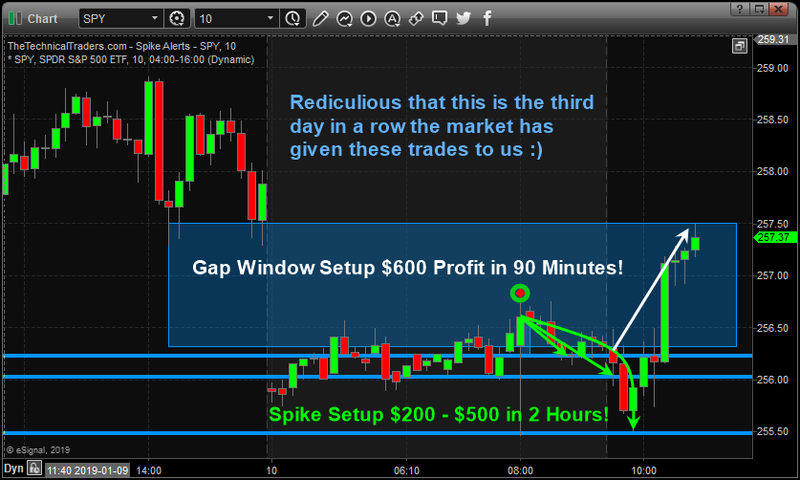 If you don't know about our two best short term trade setups which are the "Gap Window" and "Price Spike" then you'll want to learn more and we will be adding a detailed trading guide on exactly how to trade these for our subscribers. These charts and triggers are what we are implementing within the member's area with live updating charts and signals so you have a steady stream of winning trades each week to keep your account growing. The chart below shows the moves and profit potential trading the ES mini futures contract, but as long as you can trade pre-market hours with your broker you can trade the SPY and 3X SP500 based ETFs for these setups. I know these are very short term trades and not ideal for many of you to trade, and we are looking into an auto-trading solution for these early morning trades. Know that we are focusing on implementing our active swing trading strategy for a steady stream of trades as well. Stop Churning Your Account and Start Your Trading Day With Early Winners!